**SALE! ** BEST PRICES IN THE COUNTRY! PLUS FREE SHIPPING! BEST PRICES IN THE COUNTRY! 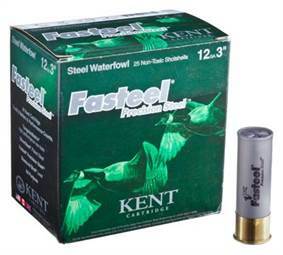 Fasteel Precision Steel 12 guage Waterfowl Shotgun Shells - 3" or 3.5"
We highly recommend these 1 1/8oz, 1560 FPS shells! As they say, Speed Kills! These shells are the best value on the markets for clean burning powerful steel shot shells. SALE! NORMALLY $200/CASE, NOW $144.95/CASE plus FREE SHIPPING! SALE! Normally $200/case, Now $139.95 plus FREE SHIPPING! SALE! Normally $200/case, Now $158.95/case + FREE SHIPPING! SALE! Normally $200/case, Now $139.95/case! **FALL SALE** Normally $220/case, Now $204.95/case + FREE SHIPPING!